Okay, I KNOW I promised never to speak of this meme again - this is truly the last time. Pinkie swear. But Wednesday's post about the Ermahgerd meme started up some of the funniest Twitter conversations I've ERVER had, with at least three noteworthy results. First, thanks to The Bearded Iris, I'll be changing the name of my blog, effective immediately. P.S. If you hustle over to her blog (after reading this post, of course) you can laugh AND possibly get $250 richer! Who doesn't like laughing and money? Second, I'd like to announce that the incredibly hilarious and sweet (two things I was NOT when I was 34 weeks pregnant) Paige Kellerman has agreed to go steady with me. And thirdly of all, the seriously funny and crazy/brave Wub Boo Mummy came up with an awesome idea - because the only thing funnier than an interwebs meme is an interwebs meme combined with embarrassing pictures from your cripplingly nerdy past. @WubBooMummy YES- Twitter can't fully express how hard I'm begging u to do that. If you do, I'll try to find an old pic of me & do it, too! Well, she called my bluff and created the Ermahgerdify Yourself Movement, and as the inaugural entry she published this side-splitting post that you really must check out. Seriously. I don't want to give anything away, but let's just say you haven't lived until you read "moccasins" in Derp Speak. Anyway, true to my word but against my better judgement, here is my contribution to the Ermahgerdify Yourself Movement. to cinch in the waist of my henley tee. Thanks for asking. Anybody remember the Just Say No campaign? Honorable mention in the essay contest, right here y'all. I did not, however, receive an award for the mullet. an unwashed, 10-year-old madrigal costume owned by the high school. This is just how we dress at my mom's house. When we're having an impromptu talent contest. I'm not even going to add anything, I think the picture's enough. Well, now, wasn't that fun? Who's going to join us? 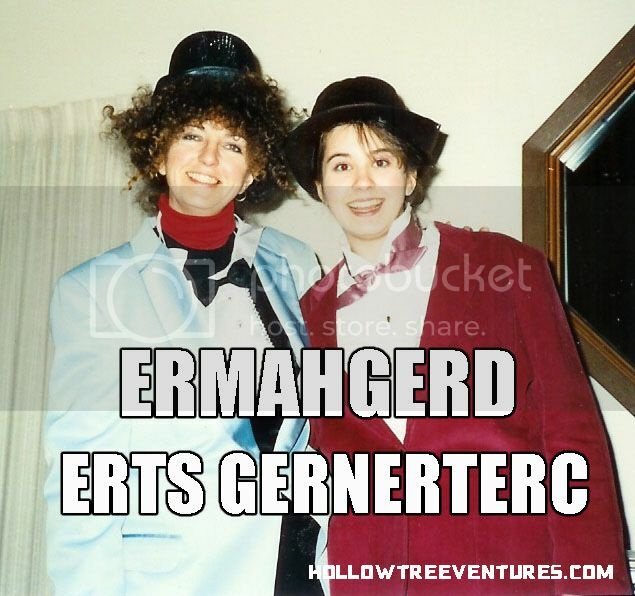 Dig through those boxes of pictures you thought you burned years ago, and Ermahgerdify Yourselves! Or, if you're like me, you can just call your mom and ask her if she has any photos of you looking awkward and dorky, and within minutes your inbox will crash with all the blackmail material she's been saving since you were a kid. Thanks, Marma. Please click the banner to vote for me while I go get a fresh perm. I love pictures of bad perms and bad hair. My hair looked just as awesome. Good thing bad hair in elementary school is not traumatic at all! I agree. She's soooo awesome! I love her and I hope she'll consider taking my phone calls again, maybe if I take down that pic of us dressed as Lounge Singer Pimps? I'm so glad things weren't digital in the 80's otherwise I might have some of this stuff, and fortunately for me, my mom doesn't have a scanner! The perm! The perm! I got my first one in the 5th grade and it looked every bit as ersum as Werd Erl. Ok, that tears it. I don't think I can truly put this topic to rest until I make one of myself. Will plot over the weekend to horrify everyone next week....Ermahgerd. YEA!!!!! That's what I'm talkin' 'bout! Erm ser erxcerterd! Um ERVRY picture of me from the 80s is fodder. And late 70s, really-though I was cute as a button when I was a toddler in the early 70s (weren't we all?) I like to think I finally got it together in the 90s and was actually kewl for 5 minutes. Luckily for me, I think I DID actually burn every single picture of me from the seventh grade. ER. MERH. GERD. The sad part for me was that there were so mant recent pics I could've used. I guess I'm doomed to be forever dorky. There isn't enough fire in the world to rid the planet of pics that embarrass me. If this is what drugs do to you, I will definitely stay off them. This shud be the new campaign. The first 2 are my absolute favorite. CAn't stop laughing. I like how in the over sized sweatshirt one you can't tell where your hair stops and the plant begins. And vice versa. Also, I think I had that same globe growing up. I might be missing the point of this post. For a long time there I might have had a potted plant in my hair, but it was such a hot mess and I had no friends to tell me, so I'd never have known. 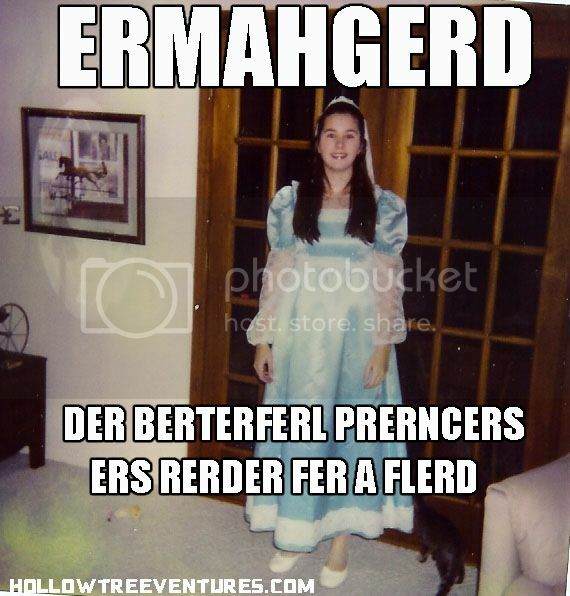 Ermahgerd, ah thert yerd nerver ersk! Erv coords ahrl merry yer! Heh heh heh... Isn't it awkward when you accept a marriage proposal and your husband finds out? This is so funny! 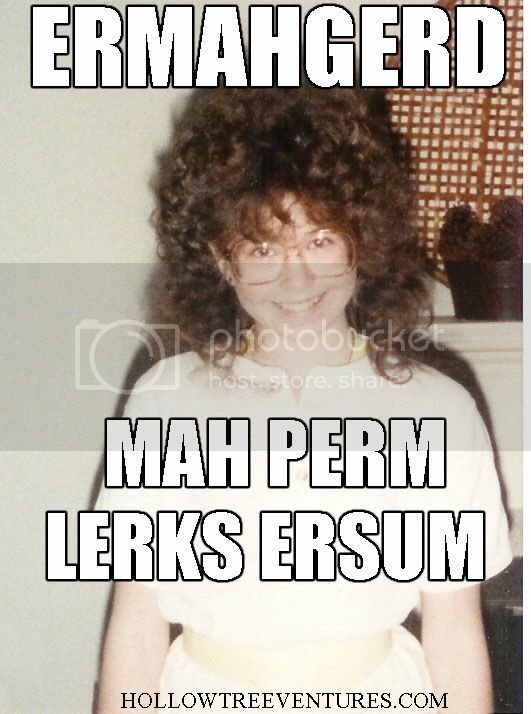 I don't think I could actually do the English Ermahgerd translation properly though..
Haha- I got two perms back in seventh grade! My hair stayed like that till I got the keratin done which is my best friend! I love your bad hair pics- totally cracked me up!! Ermehgard, doing this immediately! 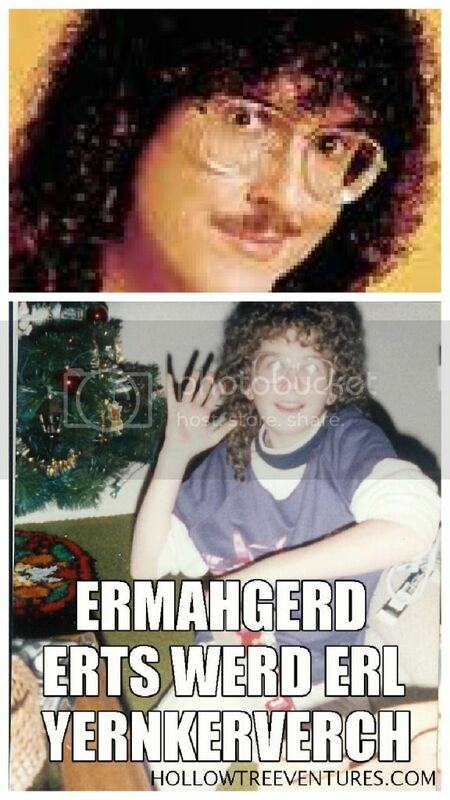 I'm pretty sure I've got some awesome perm pics myself. Please, PLEASE you hafta do it! It's like free therapy that everyone on the internet gets to laugh at. Which sounds terrible, but really it's the best. I'd LURV to see yours! If you are not coming to BlogHer so I can meet you then I will cry big fat ermagahd tears. Why does this concern you? You won't be in town to hear baby not sleeping. Can't type, having perm flashbacks. Ermagerd, you embraced the body wave with all of your being. I LOVE IT. Must stop home to dig up my photos. I'd play along, but I'm ermagerd illiterate. I would totally do this but alas, it is apparent that after digging through my old photos of myself I can't find even one that is derp worthy. I must have been too dope for derp. By the way Robyn, in the last picture in this post, what was the photographer using for flash? An H bomb? Bwahahaha! It sure looks like it, but in reality when I was growing up I used to live next door to the surface of the sun. Any old picture of you will do, Kelly. Or new picture. the reason you can't find ONE derp-worthy pic is because they're ALL derp-worthy. :DDD ZING! that must be where you get your sunny disposition. Baby, I truly admire your willingness to put what you obviously consider to be goofy pics of yourself on the innerwebs. I don't know if I would ever do that. Fortunately, I have you to put them on there for me! But for realsies, it is one of the things I love so much about you. The first part, not the last part. And those cerptcherns er herlerhers. You are freaking hysterical!! Thanks for my one wmile of today (cleaning the house to start showing it to sell. 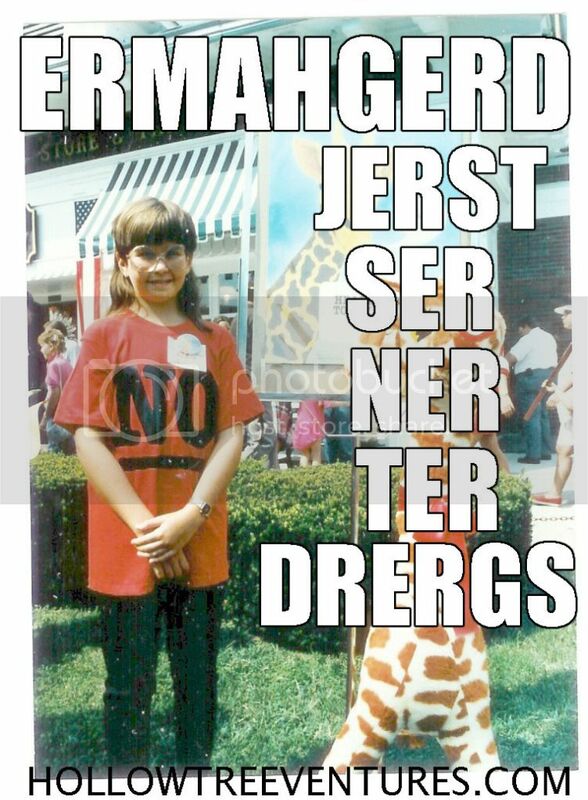 Ser nert fern. Not wmile...smile. Der. And close the parenthesis for me, okerrrr? Thank you! I always have spare punctuation lying around (are parentheses punctuation?) so think nothing of it. ))) See? I have plenty. Good luck with the house! Selling is terterler nert fern, it's the worst. I'm going to have an extra adult beverage tonight in your honor, and pretend like it isn't also a little bit because the kids haven't stopped talking ALL DAY LOOOOOONG. Whoops, was that out loud? Thank you. Just, thank you. 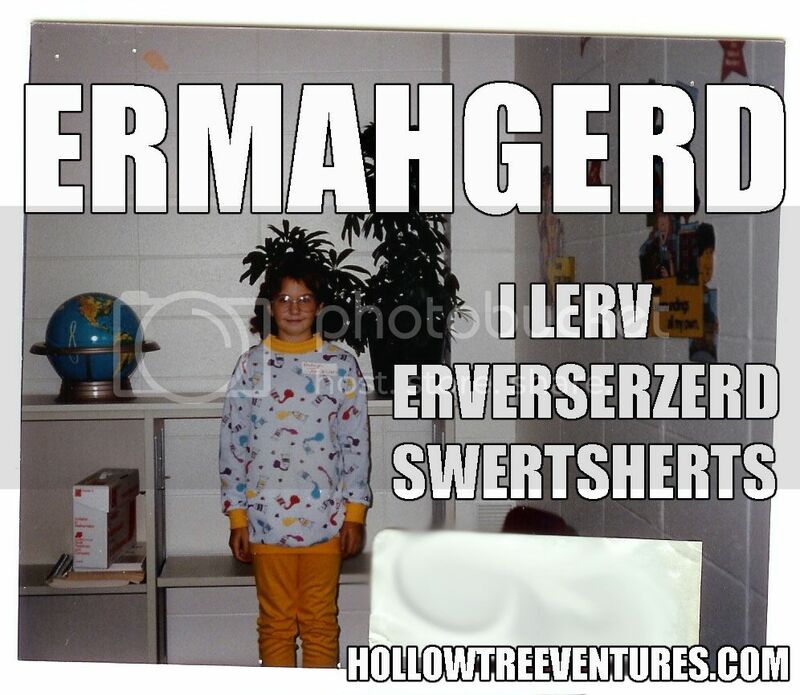 I discovered the Ermagherd meme awhile back and discovered a reason to live. I shared it with others, and they were all, "meh." So finding this post, and your pictures, is like finding a virtual trove.